LOCATION.--Lat 39°25'49", long 74°31'14" referenced to North American Datum of 1983, Absecon City, Atlantic County, NJ, Hydrologic Unit 02040302, on right bank 20 feet below dam on Doughty Pond, 100 feet upstream of Mill Road, 0.65 mi west of Absecon, and 3.4 mi upstream of mouth. PERIOD OF RECORD.--Continuous-record discharge station, water years 1923-29, 1933-38, 1946-84, and March 2008 to current year. Annual maximum tide gage at upstream side of bridge, 100 ft downstream of current location, water years 1985 to 2007. 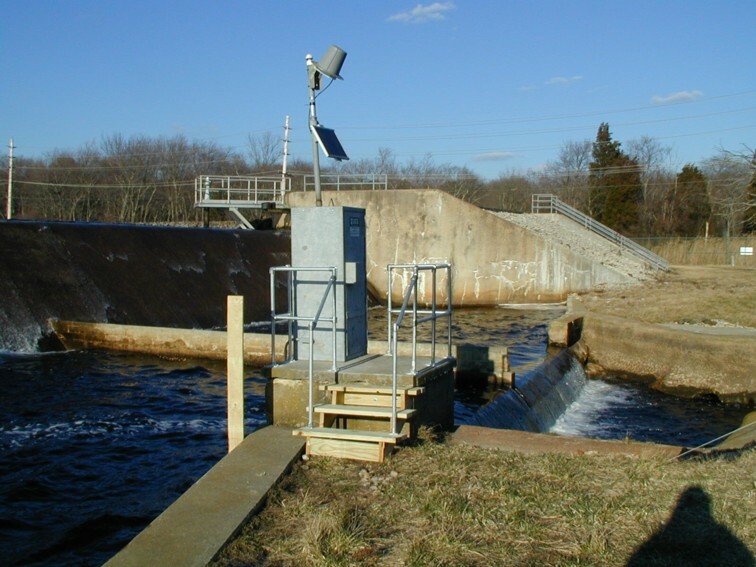 GAGE.--Water-stage recorders with telemetry and crest-stage gages above and below concrete weir. Datum of gage is 0.00 ft NAVD of 1988. To determine approximate elevations to NGVD of 1929, add 1.27 ft. Prior to water year 2016, datum of gage at 0.00 ft NGVD of 1929. Data published to NGVD of 1929 can be adjusted to NAVD of 1988 by subtracting 1.27 ft. Online annual peaks have been adjusted to current datum. REMARKS.--Records poor. Stage-discharge relationship may be affected by backwater from high tide for short periods. Due to limitations of the recording equipment at this site short periods of discharge are estimated to remove the effect of backwater from high tide. Flow regulated by Atlantic City Reservoirs: Doughty Pond immediately upstream of gage (capacity 245,000,000 gal) for period of record, and since 1936, Kuehnle Reservoir 1.5 mi upstream of gage (capacity 250,000,000 gal). Diversion from Doughty Pond for municipal supply of Atlantic City. EXTREMES FOR PERIOD OF RECORD.--Maximum discharge, not determined; maximum gage height, 7.83 ft, Oct. 29, 2012, affected by backwater from tide.